I love it when a plan comes together. This is student, Matthew Shuler, making a long putt for a birdie in the High School Border Olympics Tournament in Laredo, TX. Way to go Matthew! Student, Zach Slayton participated in the Media Day event for the World Golf Championships Dell Technologies Match Play Championship. Zach was one of a handful of junior golfers selected to join Ben Crenshaw and Sergio Garcia in hitting balls from the middle of Lake Austin onto the 13th green at Austin Country Club. A hole in one would have been worth $1 million to local charities! What a thrill to perform in front of Masters Champions Ben Crenshaw and Sergio Garcia! And, U. S. Open champion, Tom Kite was on board as well. Here is a group picture with all the participants. So proud of Zach's recent accomplishments and activities made possible not only by his good golf, but from his great attitude and participation in The First Tee Program in Austin. This is Joe Linsalata and Lee Siegismund during my Range Grinder Clinic at Clay/Kizer GC. They are using the Speed Trap from Eyeline Golf to improve swing path/plane. The goal is to make a golf swing and avoid the foam posts on the Speed Trap. In addition, one should avoid striking the plastic base. Striking the base would indicate the club was released too early. This is a great training aid and I use it often with my students. Netanel is an up and coming junior golfer getting ready to start competing in the near future. 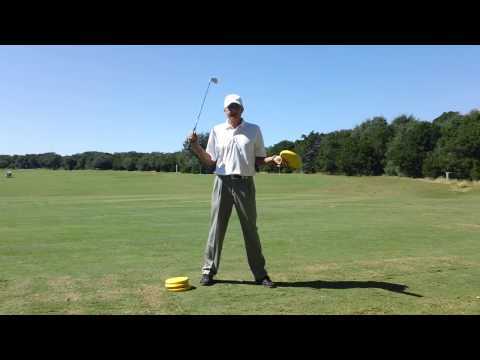 This drill is the "pump" drill and it helps with starting the downswing properly. The idea is to take a backswing, then pump the club down twice before then hitting the ball. You should feel you trail elbow coming close to your side as you gently shift your weight to the front leg as you pump. This drill will prevent the over the top move so many golfers make. This is Eric Magnusen working on one of my favorite drills. In this drill the idea is to "ring the bell" or hit the pole at 50-60 yards. When the ball hits the pole it "chimes" hence "ring the bell". With a 9 iron, play the ball back in the stance and position the hands in the middle of the front thigh. Make a small backswing and try to strike the ball first, then take a divot. For the ball to have a chance to hit the pole it has to be on a low flight. You have to finish low to hit the ball low. Eric narrowly misses on this shot, but he did hit the pole twice when the camera was off! Following are some snippets from a short game clinic conducted by former PGA TOUR, Champions TOUR and European Senior TOUR member, Terry Dill. 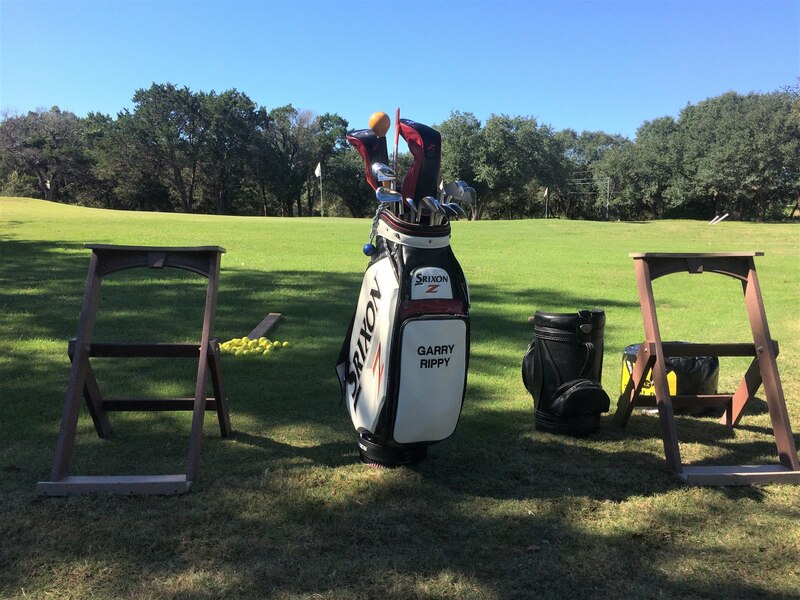 The clinic was conducted at The Hills of Lakeway several years ago and I videoed some of the clinic. Terry has been a friend and mentor of mine since 1972. In fact, he was my first official "boss" as he hired me to work as a cart attendant at Lost Creek CC when I was a junior in high school. It was also under his mentorship I qualified for the Champions TOUR Q-School finals in 2005. In this video, Terry is sharing some of his short game techniques he learned from playing the game at a very high level for a number of years. I was fortunate he shared with me many of his experiences and I utilize his techniques in my teaching of the short game and full swing too. I apologize for the video not being perfect but if you listen, you too will hopefully pick up some valuable information which will help improve your short game. Following is another video of Terry explaining some of his short game techniques. Abby Cloud Signs with Schreiner College! Congratulations to Abby Cloud for signing with Schreiner College to play her collegiate golf. I am very proud of her accomplishment. Maintaining your arm structure throughout the golf swing is very important. The thought you want to have is to keep your elbows approximately the same distance apart from the very start of the swing to well past impact. At the finish, the elbows may then come apart as the club completes the journey. This is a sample of the arms separating at the top of the backswing, after impact and the finish. In the first drill, I am utilizing a small ball between the arms. This particular ball is a small blow up plastic soccer ball. You don't want a ball so big you can't grip the club properly. I recommend using a short iron and start with small swings to get the feel. In fact, I would start with chipping length swings and then move on the a half swing with some wrist hinge. If your elbows separate at any point, you will drop the ball. This will take several reps for you to get comfortable with the ball in place. Stick with it and the payoff is huge. In drill number two, I am using a bungee cord around my upper torso. You can adjust for size by simply tying a few knots in the cord. The bungee should be tight enough for you to feel the resistance but not so tight you can't swing. The bungee keeps the upper arms more connected to your torso throughout the swing. If your elbows do separate the bungee will slide off your shoulders. I recommend beginning with a short iron and after you have successfully hit some good shots, move on through the set. Here is a short video of me using the small ball and bungee cord.